Construction recently made a list of industries with the biggest labor shortages in the nation. For every unemployed worker in the industry, there are 0.74 unfilled positions, per BLS data. Nonprofit research association the Conference Board explains in a recent report, "Blue-collar workers are much more likely than a few years ago to have a job, experience rapid wage growth, and be overall satisfied with their jobs." As well, "populations that typically have a hard time participating in the labor market are now enjoying improved labor market conditions, and there are even signs that the decades-long trend of growing wage inequality is starting to reverse." CBS News reports that a major driver of the change is slower adoption of automation technologies. "Certain occupations that were expected to continue to rapidly decline have proved remarkably resilient and even rebounded," the Conference Board wrote. Computer programmers and doctors have rarely had trouble getting hired, even in the depths of the Great Recession. Early in the recovery, it was this type of worker—highly skilled and educated—who benefited most. But in the past year, that's reversed. As the economy roars ahead, blue-collar and lower-paid industries are having a tough time finding workers. They're raising pay, sweetening perks and even doing away with requirements like drug testing in order to fill their openings. 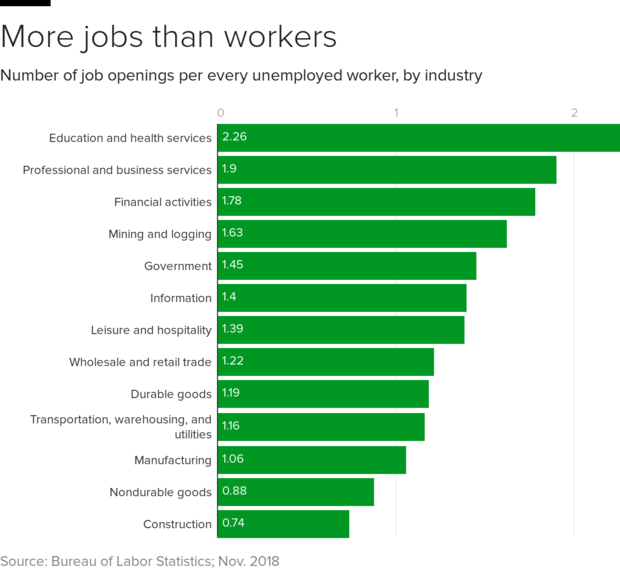 There are now more open jobs than people seeking work in nearly every industry.